My new startup, based in Taichung, Taiwan and incubated by Startup Labs. Many of the articles you see related to startups come from my experience working on this project. You can also find more specific insights about my journey there at the foodjing blog. My main website – progressive, online course teaching Mandarin Chinese one lesson at a time. Unlike other podcast courses out there, each lesson continues where the previous one left off, slowly increasing in difficulty as it replaces English with Chinese taught in earlier lessons, thereby forcing you to remember what was taught. After CLO was created, I created a modified version for one of the universities in Taichung, Taiwan to use as part of their course teaching Chinese to foreign students. This site follows the Practical Audio Visual Chinese book series, that most universities in Taiwan use to teach Chinese. A Spanish version of CLO, targeted at Spanish speakers, wanting to learn Mandarin Chinese. A website showcasing all the various iPhone apps that I’ve created, that are currently selling on the App Store. 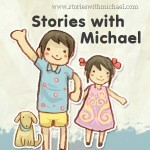 A site featuring kids stories, told by Michael Gordon, a local English teacher here in Taichung.